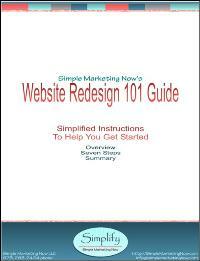 Download "Website Redesign 101 Guide"
Looking to Get Started Redesigning Your Website? Download Simple Marketing Now's Website Redesign 101 Guide to help you get started with your Website Redesign. This 18 page guide will help you focus on what matters in a website. We list 7 questions to ask before getting started. Simply out the form on the right to download a guide that will keep you focused on the ultimate goal of a business website: to get found online and connect with customers! Ready to Get Started? Download the Website Redesign 101 Guide!